Bill Viner had an idea. The owner of Pepper Viner Homes was coaching his son’s soccer team in the late 80’s and early 90’s and was tired…tired of going to tournaments and struggling to find a restaurant who could feed everyone at once and disappointed that even though there were other competitive teams they played fairly often, the players didn’t know each other off the field. 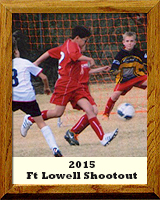 It was in those thoughts that the Shootout was born and presented by Fort Lowell Soccer Club. The tournament was designed to provide entertainment, food and soccer shopping off the field and to give the players, both a good soccer experience, sportsmanship and the opportunity to have some fun. Viner started the tournament with the Friday Night Soccer Olympics, a chance for small groups of players to compete against each other, earn more medals, but, most importantly, get to know each other in an Olympic style venue. He created a midway manned by local restaurants, entertainers and soccer shopping so teams could hang out together and enjoy both a good meal and some fun. It was a formula for success and this year the Tucson Association of Realtors Shoots celebrated it 25th Anniversary. The Tournament, still run by volunteer committee, has grown to the largest tournament in Southern Arizona and has brought millions and millions of dollars into the Tucson economy. It is the 4th largest Tucson event and the largest youth event. Most importantly, it’s still bringing players together for excellent play on the field and a weekend of Soccer Olympics and activities to bring those players together off the field. Thousand of players and all of Tucson has benefited because Bill Viner had a great idea and volunteers have committed themselves to providing the best soccer experience for the players, coaches, and their families. The 2015 tournament had 348 teams from California, Arizona, New Mexico and Texas.